Used by most garage door manufacturers. Roller tube accepts a standard 7/16"OD stem roller. Made of 14 gauge galvanized steel, 3"W overall. Includes four 1/4"-20 x 1-7/8" pancake head carriage bolts with nuts. 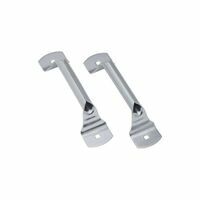 National Hardware Door Hinge, High, 7-3/8 in Overall Length, 14 ga Steel, Galvanized, BHMA A138.1, NO 3, For Metal and Wood Garage Doors Factory lubricated, steel inner race. Fits 2" standard J-track. Roller 1-7/8" O.D. Used on both wood and metal doors. Heavy-duty galvanized steel construction. Adjustable roller plate. Accepts a standard 7/16"OD stem roller. Includes four 1/4"-20 x 1-7/8" pancake head carriage bolts with nuts. Used by most garage door manufacturers. Roller tube accepts a standard 7/16"OD stem roller. Made of 14 gauge galvanized steel, 3"W overall. Includes four 1/4"-20 x 1-7/8" pancake head carriage bolts with nuts. Replaces most handles currently in use. Galvanized steel construction. Use vertically or horizontally. Includes two 1/4"-20 x 1-7/8" pancake head carriage bolts with nuts.